Lorenzo is an Italian-Swiss designer who moved to Ireland 30 years ago to work at Kilkenny Design Workshops, having studied design at University for Applied Arts—ECAL in Lausanne. Since then he worked for various design studios in Switzerland and Ireland, and in 1992 established his own design studio based in the South East of Ireland. The studio’s work is mainly branding related for artisan food companies, SMEs, some cultural institutions, and other businesses, based both in Ireland and internationally. Charities have also been part of the client list. 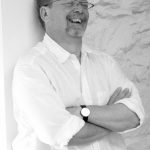 During his working career Lorenzo also worked on developing and implementing large corporate identities for Bank of Ireland, An Post, Board na Mona, Ulster Weavers, and Digital Equipment Corporation as part of their European Design Group. Lorenzo is a founding member of fuse:d, a designers and business network based in Waterford. He was recently made a Fellow of the Institute of Designers in Ireland.